Hello. My name is Robert Dennis. I have been an avid comic collector since my mom bought me my first comic (Daredevil #4) in 1965 (my dad was stationed in Germany, so the comics took longer to get there and stayed on the racks longer). 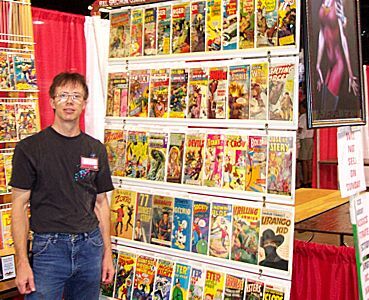 I began selling comics at conventions in 1989 to help pay bills while I was in college. 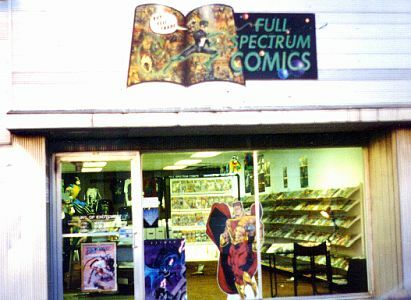 My wife and I opened "Full Spectrum Comics" shop in June, 1993 and happily ran it until December, 1995. We had a lot of devoted customers - just not enough to maintain a store front. From the beginning, I found that some of my best customers were dealers themselves, including a few Overstreet Advisors. One dealer told me that my prices were too low and grading too strict. I told him that I was just trying to be fair to which he responded, "There are two kinds of comic dealers - those that are honest and those that make a lot of money. Which kind do you want to be?" I know which kind I've always tried to be. I know I'll never be able to put my kids thru college by selling my comics, contrary to what many naive people would believe (unless you have constant access to about ten select Action #1 type comics), but I have had a lot of fun with this hobby and made a lot of good friends in the comic book industry, on both sides of the dealer table. Look for the AGSM (A Graphic State of Mind) that is now included in the item title of all of my eBay auctions which will make it easier for you to find them. Click here to see the complete list of 4000+ Bronze and Silver-age comics that I currently have in stock. Bronze Age Marvel "BOXED IMAGE" Covers ----- Click here to find out about them. While the "Census" page provided by CGC is a valuable resource, it is unfortunate that the comic book market has reached a point where a "professional grading service" is even necessary. This is largely due to the increased comic book mail order business brought about by the internet and, specifically, eBay. While eBay has made it possible for dealers, such as myself, to sell to a much wider market, it has also allowed many people to sell comics who, frankly, don't have the necessary knowledge to accurately list their comics. Also, I hate to say, it has allowed many disreputable dealers to knowingly take advantage of their eBay customers by listing comics with inaccurately higher grades. Because of this, a lot of people are becoming suspicious of anyone who is selling comics outside of the realm of CGC. This is very unfair to the majority of legitimate comic book dealers who operate on eBay and do so with integrity. I have seriously collected comic books since 1973 and quickly became acutely aware of the need for the ability to accurately grade a comic so that I could know whether the comic shop owner was charging me a fair price or not. I have found that grading is an art form - not a science. That is why comic book grading has always been so hotly debated. While the Overstreet Price Guide has set a standard that is largely accepted by the comic book community, the interpretation of the grade definitions is varied at best. The technical defects have to be assessed, of course, but, in the end, it all comes down to "visual appeal". And that is where the arguments start. A water stain that is only visible when held to a light may not bother one person but make the comic totally unacceptable to someone else. Defects on the back cover may affect the grade only slightly to some people but be regarded with the same scrutiny as the front cover by others. CGC itself suffers from this problem. That is why a slabbed CGC comic that is opened "may not receive the same grade" when sent in for recertification. While I'm sure that the CGC grading staff consists of capable individuals, their credentials and grading ability, as far as I and many of my peers are concerned, are no more reliable than mine. You can be assured that the grade that I now put on each of the comics that I sell on eBay is fairly and wisely determined by over 30 years of acquired knowledge in the comic book collector arena, both as a collector and a dealer. Thank you for your time and good hunting! Photos taken of me at the Wizard World Con in Chicago in 2003 and our Full Spectrum Comics shop circa 1994. I occasionally do freelance work restoring original comic art. 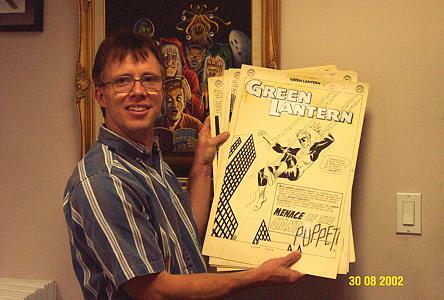 Here I am holding the original art to the Green Lantern #1 cover story by Gil Kane and Joe Giella! FYI: I DO NOT restore printed comic books. I DO restore original comic art.